July 19, 2016 By This post may contain affiliate links. Decorate Palm Tree Cookies using modeling chocolate to give them texture including 3 dimensional coconuts. 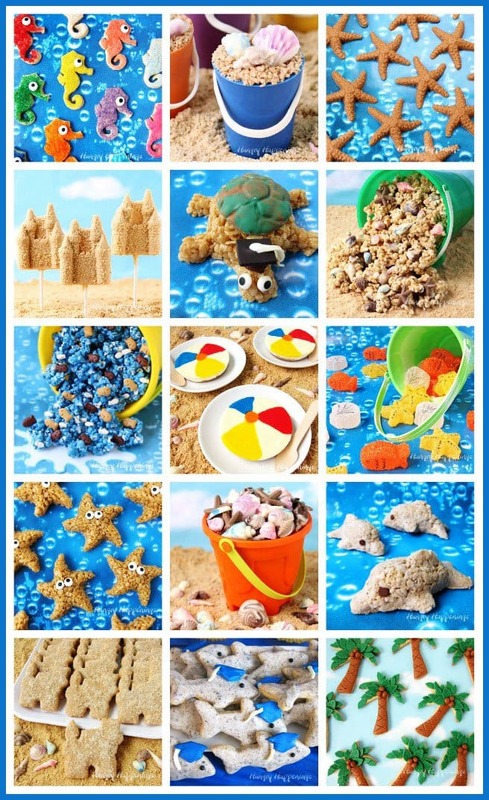 These cookies will make a great addition to your pool party, luau, or oceanfront wedding. 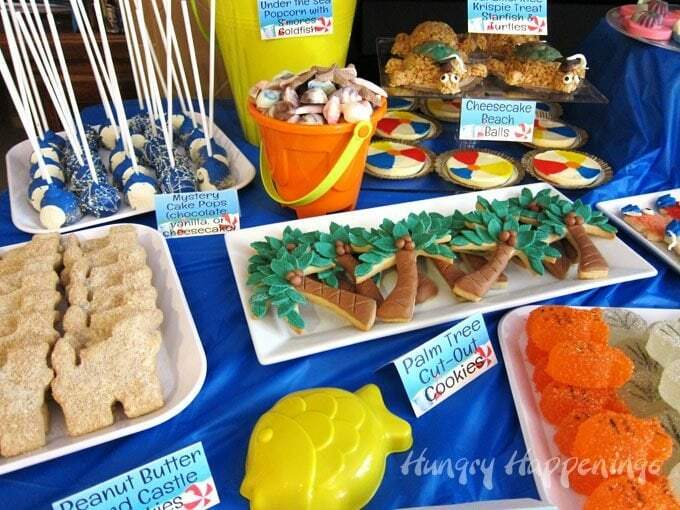 When I designed all the treats for the beach themed graduation party a few months ago, I knew I wanted some palm tree cookies, but I don’t enjoy piping royal icing. I’m just not good at it, so I had to come up with another way to decorate them. After playing around with several different decorating techniques, I finally settled on using modeling chocolate. For these palm tree cookies you’ll need brown modeling chocolate for the tree trunks. You can make your brown modeling chocolate using pure milk chocolate or light cocoa candy melts. You’ll also need green modeling chocolate (aka candy clay) and you can either use green candy melts or you can color white chocolate using green candy coloring. If you’ve never made modeling chocolate, you can find the recipe and step-by-step tutorial on my Chocolate Making Tips Page. Decorating the cookies is a bit time consuming, but the final product is so worth the effort. These cookies were the most popular cookies I made for the party. I had enough cookies to refill my tray three times and they were all gone when we cleaned up. I am always so happy to see an empty plate at the end of an event. Whether the cookies all got eaten or were wrapped up to bring home, it didn’t matter, as long as people enjoyed their treats. 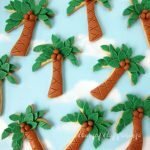 Cut-out cookies shaped like palm trees decorated with modeling chocolate to have a 3 dimensional effect. *You can find the modeling chocolate recipe on the Hungry Happenings' Chocolate Making Tips page. Mix the flour, salt, and baking powder together in a bowl. Set aside. Stir in egg, vanilla, and almond extract. Add dry ingredients and stir just until combined. If the dough is sticky, add a small amount of flour. Lightly dust your work surface or non-stick mat with flour. Roll the cookie dough out to between a 1/16 inch and 1/8th inch thickness. 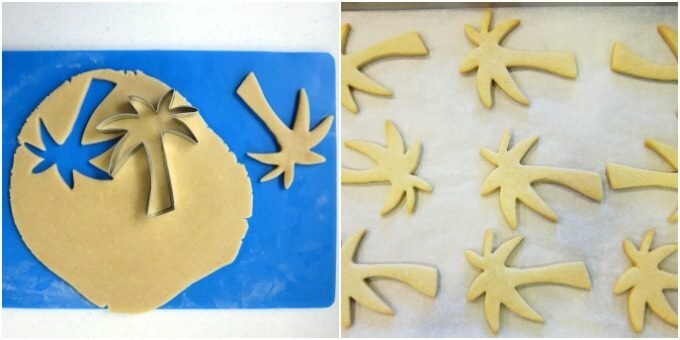 Cut dough using palm tree cookie cutters. Freeze cut cookies for 10 minutes. Peel off cookies and set on a parchment paper lined baking sheet. Bake cookies for 7-10 minutes. Roll out brown modeling chocolate and cut using the palm tree cookie cutter. Cut so you just have a brown tree trunk. Brush a thin layer of corn syrup over the cookie trunk and press the modeling chocolate on top. Use the back of a knife or spatula to make X's across the trunk. Roll out green modeling chocolate. Cut out up to 12 small leaves and 6 large leaves per cookie. Brush a thin coating of corn syrup on the top of the palm tree cookie and press leaves over top, layering them as you go. Pinch off pea sized pieces of the brown modeling chocolate and roll into balls. Attach 3 of the balls to the center of the leaves on each palm tree cookie using corn syrup. Let cookies dry for at least 1 hour before stacking or packaging them. Make the sugar cookie dough then roll it out onto a silicone mat that has been very lightly dusted with flour. You can also use a cutting board, but I love using the mat because the cookie dough doesn’t stick at all even with the tiniest bit of flour dusted over top. 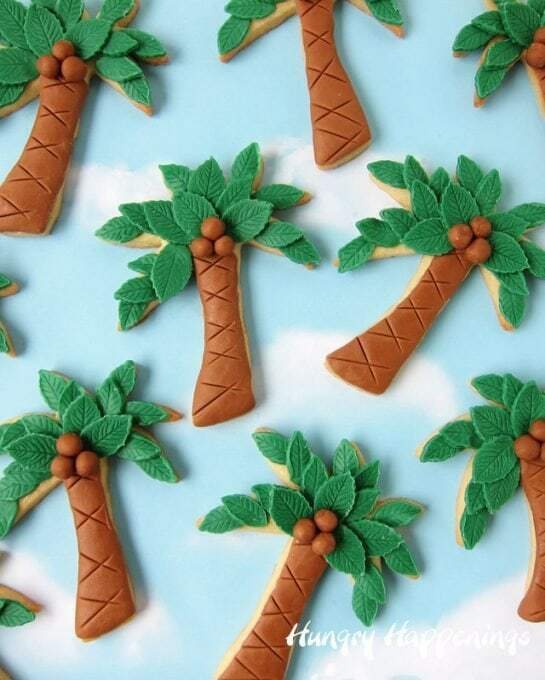 Use a palm tree cookie cutter to cut out as many cookies as you can make fit. Then peel away the excess dough kneading that into some fresh dough before rolling it out to cut more cookies. Pop the silicone mat with the cookies on top in the freezer for about 15 minutes. Then remove the cut cookies from the freezer and peel them off the mat and set them on a parchment paper lined baking sheet. Your chilled cookies will be perfectly shaped and wont get stretched as you pick them up. You can, if you have enough silicone mats, just bake them on the mat. Bake the cookies until the tops look dry or the edges just turn light brown, about 7-10 minutes then allow them to cool completely. While your cookies are cooling, roll out your brown modeling chocolate to about 1/16 of an inch thickness and use the same palm tree cookie cutter to cut out trunks. You can’t just get the trunk, so you’ll need to trim the chocolate at the top of the trunk. Brush the trunks of the cooled palm tree cookies lightly with corn syrup and press the modeling chocolate trunk over top. Smooth out the edges then use a spatula or knife to intent X’s on the trunk. This will give the trunks a textured appearance. To create the tops of the trees, roll out green modeling chocolate really thin. Use a small and medium leaf plunger cutter and cut between 10 and 12 small leaves and 5 and 6 large leaves per palm tree cookie. Brush corn syrup over the top part of the palm tree cookie and begin attaching the leaves at the pointed ends, layering them as you go inward. Fill in the center with the larger leaves. Pinch off small pea sized pieces of brown modeling chocolate, roll into small balls then attach in the middle of the leaves just above the trunk using some corn syrup. Let the cookies dry for at least an hour before stacking them onto a plate. You can package them in clear cellophane bags to give out as party favors too. If you recreate these Palm Tree Cookies be sure to link to this post and/or tag @HungryHappenings on Instagram and send me a picture so I can share it in my Readers’ Gallery. I do LOVE the 3D effect of the trees, actually I love everything about them! I can see why all these disappeared! My granddaughter gifted me with a set of beachy cutters a while back. But, since I am not much of a piper, I have only gazed longingly at the palm tree cutter. You have created the perfect solution. Your cookies are both pretty and -with the addition of the candy clay- sounds yummy! I know if I practiced I’d get better at piping royal icing, but I just don’t have a very steady hand, so I have to find other ways to decorate my cookies. I’m glad you like them!